Nancy and I just attended the opening on Tuesday of GLOBAL CITIES, the summer exhibit in the awesome space of the Turbine Hall of the Tate Modern in London. 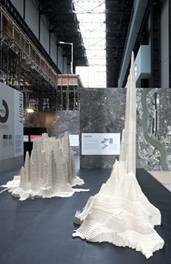 This exhibition is based on our dear friend Ricky Burdett’s magnificent exhibit, “Cities, Architecture, and Society,” at last Fall’s Biennale for Architecture in Venice. (q.v., my review of La Biennale, www.columbia.edu/~rr322/TheBiennale.htm ) GLOBAL CITES will be at the Tate Modern from 20 June through 27 August, and I most strongly recommend that any of you who will be in London go see this incredible exhibition. 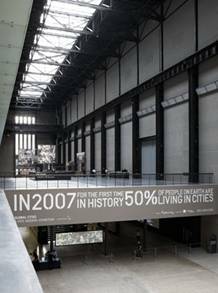 As one enters the Turbine Hall, one is confronted on the bridge above the entrance to the exhibit with a huge graphic that announces the central fact on which the show is based: “In 2007 for the first time in history 50% of people on Earth are living in cities.” Walking under the bridge, one arrives in a darkened area where, on a wall to one’s right, a video presentation of the overall themes of the exhibition is projected. It is as beautiful and entrancing as it is informative. One of it’s most memorable facts is that of the 50% of the world’s population currently living in cities (a number that is projected to grow to 75% by 2050), fully one third live in slums. It is clear that the nature of the world’s cities is going to have a huge and profound impact on the nature of life in the 21st century. Cities have the potential to be environmentally sustainable, socially inclusive, and culturally enriching—but they also can be quite the opposite. GLOBAL CITIES is an examination of some of what works and some of what does not in some of the world’s most important urban areas, with an eye toward those things that will make a difference in the very nature of the world in which we are going to be living. This section explores some of the most populous city regions of the world—the greater Tokyo area (the largest urban region in the world today), and the expanding metropolitan zones of Mexico City and São Paulo. Each city displays different spatial characteristics and varying levels of success in managing urban change through governance and policies to contain sprawl. This section provides an overview of the distinctly different urban forms of five cities: Istanbul, Johannesburg, London, Mumbai, and Tokyo. Satellite photographs illustrate the diversity and complexity of human impact on these cities, as physically manifest in street widths, blocks and plot sizes, and distribution of open green space. Urban form—the DNA of the city—bears the imprint of the flows and forces that shape our daily lives. Good urban design can produce desirable neighborhoods in cities across the world by balancing dense development with access to open spaces and good transport. Dense urban environments can create sustainable cities… The four models shown in this section compare, at the same scale, the number of people living within the administrative boundaries of four of the ten cities… The peaks show high residential densities, with the largest number of people concentrated in a square kilometer. They range from the high density of Cairo and Mumbai to the more dispersed, but bounded London (contained by the Green Belt) and the sprawling Mexico City. In an urban context, diversity—the level of variety within a city—is usually interpreted as its ethnic and racial composition. But diversity has a much broader range of indicators: the spread of ages and incomes, education levels, the range of employment sectors, and people born in the city versus newcomers… Urban segregation can take various physical forms, from fortified residential districts to business enclaves… Better integrated cities are usually designed around shared facilities, such as public parks or accessible public transportation systems, and a more continuous urban grain that connects rather than separates communities. A variety of different patterns are examined here, with reference to…Johannesburg, London, Los Angeles, São Paulo, and Shanghai. The art work selected to provide a visual “feel” for the cities in the exhibition is mostly quite extraordinary. Some of the video installations are true masterpieces: my favorites are Yang Zhenzhong’s Let’s Puff (2002; presented on two opposing walls—the one wall running a scene of the crowds strolling on Shanghai’s pedestrian thoroughfare Nanjing Dong Lu, with the second wall showing a young woman taking deep breaths and blowing toward the first wall—and the people on the first wall apparently being blown backwards, slowed down, or speeded up by the woman’s blowing at them) and Francis Alÿs’s Railings (2004; with alternating repetitions on each of three adjacent walls of footage of the artist walking around three of London’s wonderful squares, while running a drum stick across the metal railings, gates, pillars, and even cars lining each square—resulting in a constantly mutating montage of visual imagery and percussive rhythms). Other video installations, while less artistic, are powerful in their content or meaning, like Osman Bozkurt’s excellent piece Auto-Park/The Highway Parks of Istanbul (2003; a documentary about small green spaces in the midst of life-threateningly dangerous encircling highways, that are used for “relaxation” by residents who risk life and limb to get to them only because of how deprived they are of access to any other open space at all). 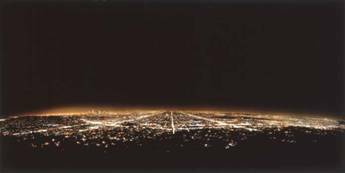 And some of the photography chosen by the Tate is truly breath-takingly beautiful—the most magnificent example being Andreas Gursky’s Los Angeles (1999). It is unfortunate, however, that some of the photographs from the original Biennale exhibit were not presented in equally high-resolution form—most notably Luiz Leirão Vieira’s incredible photos of luxury apartment buildings overlooking the impoverished favela in São Paulo ironically named Paraisópolis (Paradise City). The information presented in GLOBAL CITIES—graphically as well as in text form—is riveting: it is totally comprehensible, profoundly interesting, excitingly provocative, and of obviously critical importance. It is rare indeed to find an exhibition that it at one and the same time so informative and so enjoyable. It is a thoroughly engaging experience that will draw you in and keep you entranced for as much time as you have to give to it. 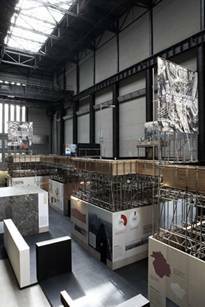 The only generally unsuccessful parts of the exhibition—and they do not figure very large in the overall experience of it (many of them actually being on the peripheral second story of the exhibition)—are the commissioned projects by architects. Zaha Hadid’s Form Informing Urbanism—Parametric Urbanism was so cryptically written that it was virtually incomprehensible: until Ricky explained to me that it was a projection across certain conceptual building types of the eastward expansion of London along the Thames Gateway, I had no idea what it was about. Rem Koolhaas’s Dilemmas in the Evolution of the City was a rather pretentious and ultimately shallow piece of intellectual fluff. Mixtacity, a fanciful work by Nigel Coates, was at least quite amusing in its vision of the Thames Gateway with spools of yarn, giant hands, sugar cubes, and other found objects used to represent buildings of humorous cultural diversity and meaning. To understand just how engaging and successful GLOBAL CITIES is, allow me to relate an observation I made on the third day of its being open to the public. Nancy and I returned that day to spend a couple of more hours absorbing the richness of the exhibit. It was a Friday, in the early afternoon, and the Turbine Hall was packed with visitors to the exhibit. The visitors were of all ages, and they were spending hours lingering in the Turbine Hall, confronting the images and texts, the meanings and emotions of this exhibit: intently looking, absorbing, animatedly discussing with each other (in more languages than I was able even to recognize, by the way), and often taking extensive notes. I even watched several visitors photographing passages of descriptive text! This clearly is an exhibition which is generating profound reactions. For a fuller look at the exhibition, you may wish to view the extensive presentation of it on the Tate Modern’s own website, at www.tate.org.uk/modern/exhibitions/globalcities/default.shtm . Return to CULTURAL INFROMATION homepage.